It’s hard to believe July is over and August is here! Summer is flying by here in Cape May, but it’s never too late to start taming that classic frizzy hair that the humidity and heat brings. If left to the elements in the summertime, my hair resembles a lion’s mane; because of this not-so-desirable quality, I consider myself a near-expert on hair products that tame the beast and leave my hair silky and ready for any kind of weather. Here are my 4 top picks of products that really do help! Garnier Fructis Sleek & Shine Anti-Frizz Serum: Put this on wet hair after showering and you’re ready to go; no need to blow-dry. This serum will help curls feel smooth and look neat. Be careful not to overdo it though, you don’t want a greasy look! All you need is a tiny amount on your hands to comb through damp hair. One of the great things about this product too is its price – you can find it for less than $5 at Walmart. REVLON Uniq One All-in-One Hair Treatment: I love this one. It is a leave-in conditioner that you spray sparingly on wet hair. This is perfect for fixing hair that’s dry and/or damaged from sun and salt water. As someone who is constantly on the beach and swimming in the ocean pretty much as soon as I get off work, this product keeps my hair healthy and protected! Snag it on Amazon here (hint hint: it’s cheaper online than if you buy in a salon). Detox Dry Conditioner: Perfect for the days you only have time for a quick body shower and are running out the door! A few sprays of this will leave unwashed hair feeling and looking refreshed and shiny. It’s also great to use after a blowout; it will help the style last longer. You can order this on Sephora. Olivine Love + Salt Beach Hair & Body Mist: Amazing combination! A product that provides natural, flowy beach waves through your hair and also a gorgeous-smelling perfume all in one. You can spray on clean wet hair, or bring to the beach and use after a dip in ocean. It’ll provide a voluminous windswept look to your hair and re-hydrate your skin with its natural salts! Buy here. Do you have any go-to products or secret tips when it comes to summertime hair? Comment below! Anna is a freelance writer and communications professional from Philadelphia. 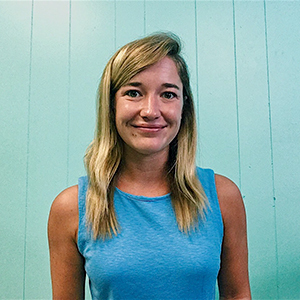 She worked in public relations and research for four years after graduating Loyola Maryland, then left her office job in June 2016 to fulfill her dream of long term travel by backpacking through Europe, Southeast Asia, Australia and New Zealand.